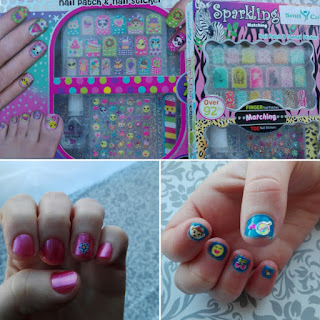 If you remember I previously told you about a deal that you could get a discount on SmitCo LLC products, including these two different kits of nail stickers and patches. Right now on their website you can get both of these sets together for a discounted price of $16.99. My daughter was super excited when she saw what had came for her and myself to try out. One of them is called sweet crush and has a variety of different animals and emojis and fruits and sweet treats with big eyes. It has 77 pieces she thought all of the characters were absolutely adorable and couldn't wait to use them. It comes with a top coat polish and a file as well. You definitely want to use the top coat polish to help seal the stickers down otherwise some of them will pop off. The other said is filled with nail patches and stickers that are animal prints or animals and a variety of hearts and flowers. This one also comes with a nail file and topcoat and again you should use the top coat to help seal the stickers down. We had fun doing our nails together using these. She used stickers on each one of her nails whereas I chose to just have an accent nail with one sticker on it.